Sat Nam. I am in receipt of your letter of February 11, 1979.
the light. May you live to the destiny of your name to be true to your soul. Keep up…keep courage. In the Name of the Cosmos which prevails through everyBODY and the Holy Nam which holds the world. I have “worlds upon unseen worlds” to share about the experience of living my name, but it’s late and I just wanted to get this out there in celebration of my journey and all it feels like and means to be in relation with the Guruatma of me. Many of you ask about my name, and about what it means to have a spiritual name. 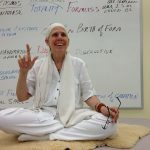 Here’s my fav reading on that topic from my teacher’s book called The Mind – It’s Projection and Multiple Facets by Yogi Bhajan PhD and Gurucharan S Khalsa PhD. The mind is like a camel. Have you ever gone on a camel ride? If you are not an expert you will tear your skin and pull your muscles and legs along with every other part. To ride the camel successfully you have a special way to sit on it, and a special way of synchronizing with its motion. And if you are very lucky you have a nail through its nose so you can direct it. Then it can carry you over endless deserts. If on one day that nail is gone; you will remember that day well! The camel, by nature, knows all kinds of tricks to throw you. It loves to do it. Then, after you fall hard from about ten feet, the camel has a very effective policy. It sits on the ex-rider and relentlessly grinds it and finally kills it. Now, this is exactly what the mind does to you. You need to punch the hole and conquer the mind, ride it in synchrony to your path. The mind is supposed to be your power, your instrument, and your projection. It can tell you where you are and what is going on. But that very mind- becomes your enemy and it kills you. It brings your downfall. It was given to you to connect you to God, and to help you express and experience you. How can you put that nail in? How can you create the hole in the mind and see the beacon of the soul’s light? One way comes from the basic theory that everybody has a destiny. Destiny is your highest actions and consciousness in this life. It holds your sense of mission and purpose. One procedure to tap that inner compass of destiny is to get a spiritual name, a name according to your destiny. These days this is not a common technique. We don’t realize the power of the word and the gift of destiny. We pick up any nickname. We do not calculate its impact and effect on that soul. Actually, when a child is given a name, the first thing he has to be told is what his destiny is. Why does he have this name? Names given according to feelings will take you to those feelings. Names given by destiny will take you to the destiny. It is just a meditation that everyone repeats for you. When you think of that person and repeat a name that calls on the destiny in them, you pray for that person and that person is blessed each time.